This K-Cup pack blend of African and South American coffees is an aromatic masterpiece. The sweet floral aroma inspires a cup that is bright and delicate with hints of blackberry and citrus. 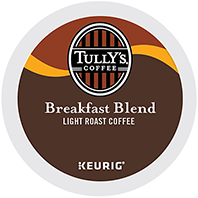 Tully's Breakfast Blend brings warmth to the beginning of your day.